Essential information for potential buyers of Falabellas. When people are looking for a Falabella to buy, they may not be aware that there are a number of sellers/breeders who are currently abusing the Falabella name in order to pass off non-Falabella horses as genuine ones. 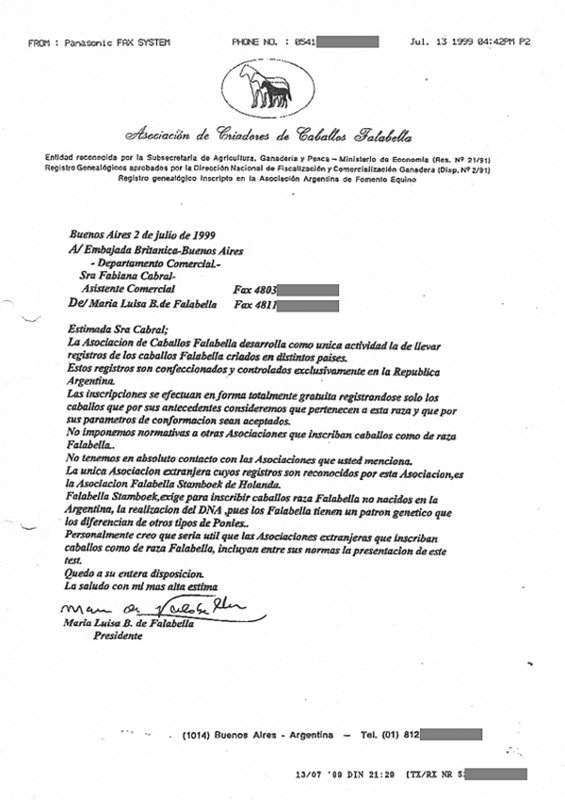 During Maria Falabella's later years, Susan Eckholdt was her UK representative, charged with speaking out against the fraudulent marketing of the breed in the UK. The British Falabella Studbook was established in 2002, after Mrs. Stella Dutchyn obtained the coveted ‘Daughter Studbook’ authorization status from the Mother Studbook in Argentina, the Asociacion De Criadores De Caballos Falabella, the ACCF. 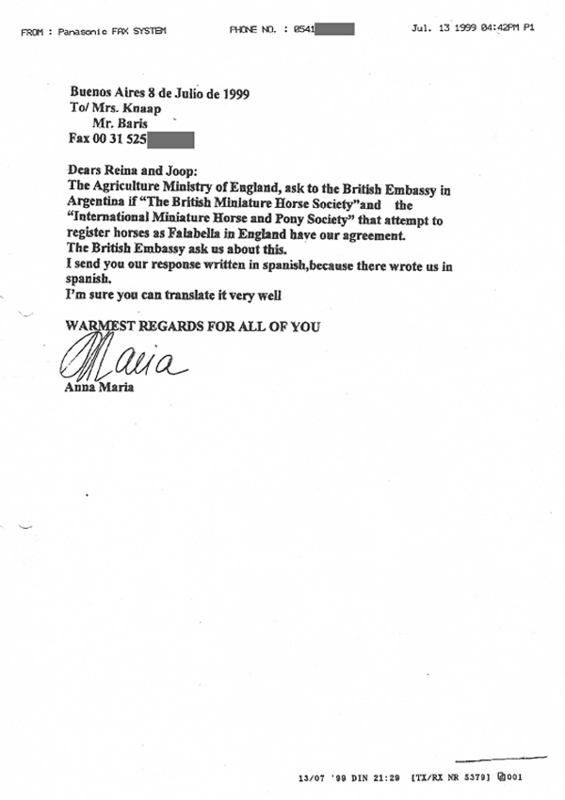 Prior to this Mrs. Susan Eckholdt had raised the subject of UK Falabella registration with Sra. Maria Luisa de Falabella on a visit to Buenos Aires in 1997, discussing the possibility of creating a British Studbook which would be run along the same lines as the Dutch Falabella Studbook which was established in 1995 and which later became the European Falabella Studbook/FSE. Then, during a fifteen month investigation involving the Advertising Standards Authority (between May 2017 and August 2018) and an Independent Review conducted by Sir Hayden Phillips, DEFRA's error came to light. This means that it can be proven to be the foal of a particular stallion and mare. And a client should be able to see that a pedigree traces back to Argentine imports 100% - if not, the words 'part-bred' or 'blend' should be made clear. If a breeder/seller cannot be honest on this point alone, there may be other things they are not disclosing. The FSE (European Falabella Studbook) and the BFS (British Falabella Studbook) both of which require DNA testing in order to 'parentage qualify'. "The Falabella Studbook Europe association was founded by its three initiators in 1995, and has been acknowledged by the ACCF parent studbook in Argentina, as well as by the PVE ministerial product board. This is the official studbook registration for this rare breed of miniature horses for all of Europe. In the year 2000, all members unanimously agreed to convert the studbook association into a non-profit organisation (foundation), to ensure the identity and continuity of the breed. FSE provides registration and DNA reports for 100% purebred Falabellas across all of Europe, and has joined other non-profit organisations besides the ACCF parent studbook, such as the British Falabella Studbook (BFS), and Falabella America (FMHA). The FSE has the objective of protecting the special Falabella breed - the only miniature horse breed in the world - and preserving it from extinction, as well as continuing registration of 100% purebred Falabellas, promoting breeding efforts involving Falabellas with healthy constitution and correct, functional, and appealing exterior features. Moreover, the name Falabella has been filed and registered. The name cannot be used without the approval of the studbook. 'Studbook Registration Purebred Falabellas' possess original studbook documents, which can be used to trace the origins of the Falabella. An additional condition is that both the father and mother animals must be 100% purebred, as well as the three generations preceding them, and the male and female ancestors must descend from the Establiciementos Falabella Ranch in Argentina." was the ONLY authorized European register in 1999, before the addition of the BFS in 2003. A Falabella horse is a 'rare breed' pedigree animal whose bloodlines can be traced back more than 150 years to one ranch in Argentina. The Breed Standard has been approved by the Argentine State as well as their Genealogical records. 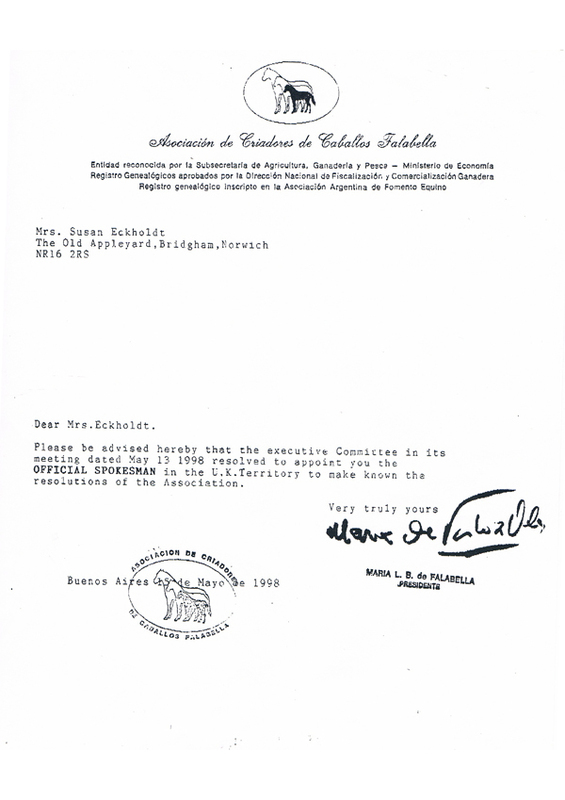 The Asociacion de Criadores de Caballos Falabella is the only entity admitted by the Argentine State to keep these records. 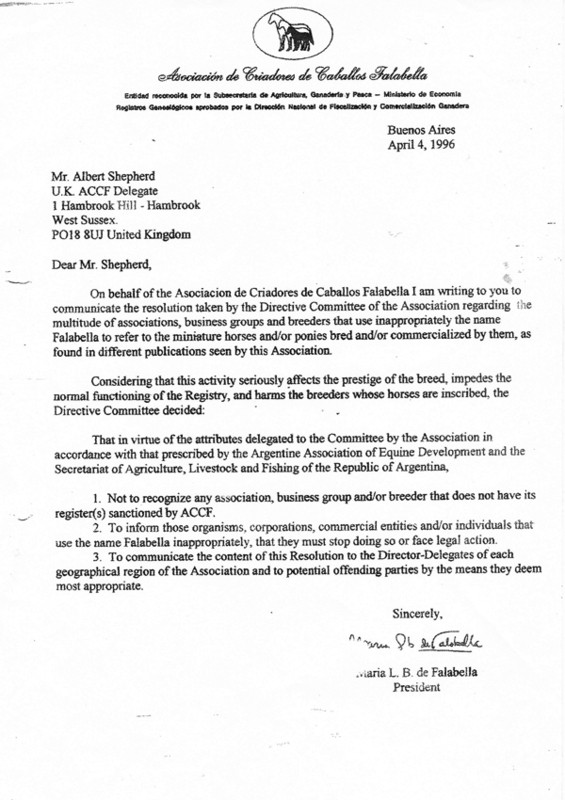 The records kept by the ACCF are also filed with the Argentine Association for Horse Development (AAFE). "By definition, a Falabella must have 100% Falabella bloodlines." There are many part-breds or 'blends' that are currently being marketed as Falabella horses, both in the UK and elsewhere. Unfortunately it is often the case that once a client has been the subject of fraudulent marketing, they too will continue to call their horses Falabella horses. Whilst we applaud the efforts of the IMHPS (International Miniature Horse and Pony Society) and their Premier Register of Falabella Miniature Horses '1P' (which also requires DNA testing) it was never authorized to register Falabellas. There are many non-Falabellas on the IMHPS 'Register 1 The World-Wide Register of Falabella Miniature Horses' the wording of which is open to abuse. 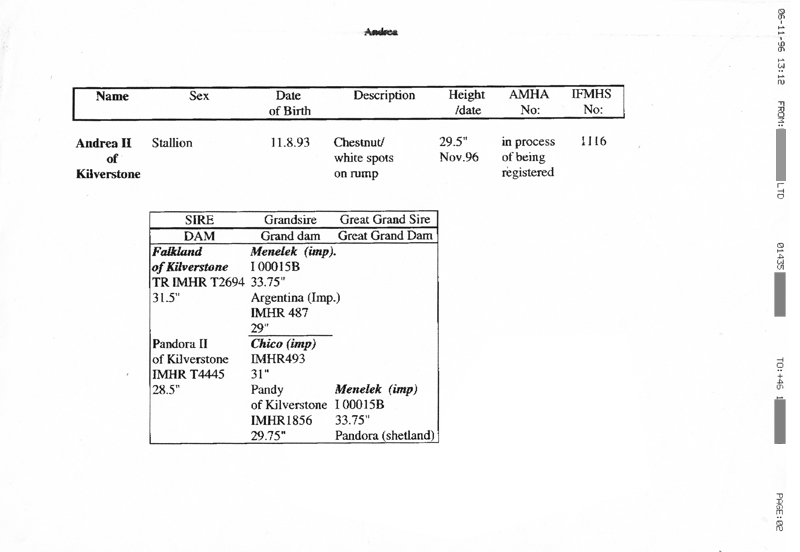 Unscrupulous breeders just insist that their horses are genuine Falabellas that have not been DNA tested. The Mother Studbook (The Asociacion de Criadores de Caballos Falabella) authorized only the British and European Studbooks to take on that duty. 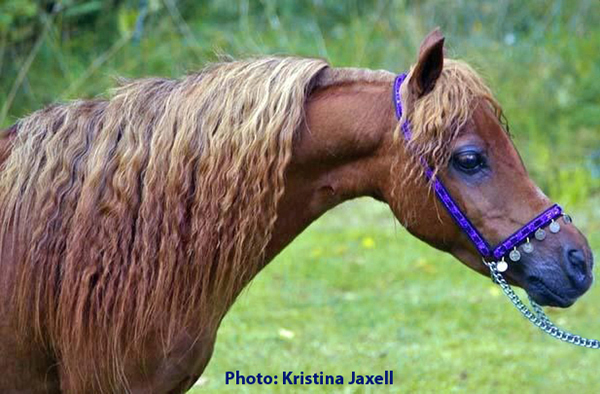 The International Falabella Miniature Horse Society (IFMHS) also registered a number of non-Falabellas, finally closing it's doors after an investigation by the Advertising Standards Authority. We have the greatest of respect for all animal life. A part-bred Falabella or 'blend' is just as loveable as a Falabella and may look very similar. Prior to her first Falabella imports, Lady Fisher had a miniature horse stud based on Shetland and British Spotted Ponies, some of which were later crossed with the Falabella imports. Those Falabella imports were DNA tested for AMHA registration in the 1990's and this has been a useful tool in establishing the Falabella lines. The family tree of a beautiful part-bred Falabella, Andrea 11 of Kilverstone, full brother to the famous Edwardo of Kilverstone. Many of Edwardo's progeny have been registered and sold as Falabellas, appearing on a number of un-authorised societies registers. A client should be entitled to know the truth. Nobody should have to ask if a horse advertised as a Falabella is a real one. They should complain if they discover non-Falabellas / part breds being marketed as Falabellas. Horses come under the 'Consumer Rights Act 2015' so if buyers discover they have been the subject of fraudulent marketing there are legal rights in place to protect them. it is a breach of Trading Standards.